Design source files you already have to be prepared prior to the installation design to your online business card. It is important! To be able to install your design is absolutely necessary for the site to was included package "All Inclusive". 1. In index.htm with a text editor ( we recommend Notepad, HomeSite or DreamViewer, do not recommend Word, FrontPage) replace "Text page" on OSNOVNOYTEKST Please note, writing is very important: it is caps together, without spaces . OSNOVNOYTEKST - is the label when the system will meet her, then at this point will display the main text of the page. 2. Also, use a text editor to write index.htm TEMASTRANITSY in the places where there should be substituted the title page. Always worth the label placed inside the tag < title > TEMASTRANITSY </title > and at least once somewhere on the page, including tags < h1 > TEMASTRANITSY < / h1 > ;, < h2 > TEMASTRANITSY < / h2 > or < h3 > TEMASTRANITSY < / h3 > This is important for good findability of your site in search engines. Sitemap in case of an error in the design will allow your site to be indexed by search engines. Logon management online business card. Carved code inserted into another empty text file, it is useful to us now. Flowers I've highlighted the code for you, we need to set the menu. 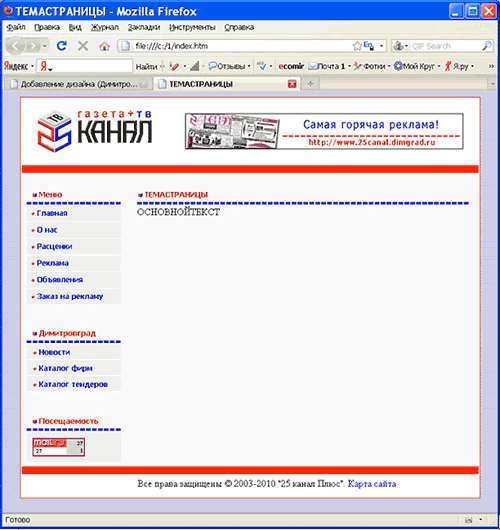 Open content management system, business card. Under the navigation menu on the left of the page there is a link "Setting Menu". Click on it. Bottom of the page will be a link "Adjusting the html- code to display the menu ", click on it. To open the form. Sent design designer did not provide to any menu item different from the others, if we are already in it. We also let you select the current item. Pay attention! If you do not want the current menu item once stood, then in the 4 copy is the same as in the 3. Then the current item will look exactly the same as other menu items unremarked. Since we have with you a submenu does not provide design, all other fields we do empty. Save the settings menu code. We go to the point of "Personal Design" menu "Design" at the top of the strip control system for a small website. Click on the link "Add new design". Write some code name for the design. In the "HTML- code design" paste the clipboard code file index.htm, in which we have previously done all tags. Push the button "Save", and then immediately link "Go to the list of designs".This is important ! Design we have uploaded to the site, but so far it is not included. Let's turn it on. On the next page in the "Making pages in design" for item "The design of the default" choose our new design and click on the button "Save". Everything is ready!On regular pages of the site you will work your design, and in the pages of the control system will be standard design to always and it was easy to fix design errors. You can at any part of the design to make some text area that can be visually edited separately from the main body of the text. For example, you have three columns. In the center column should OSNOVNOYTEKST. And in the left and right columns some of his texts that you want the user could also edit. This can be done in the system. To do this, click through "Site Pages" menu "Content" to create a blank page. Remember her number. The number can be found by clicking on this page. In the address bar of the browser will be written, for example, www.25canal.dimitrovgrad.info/page20.html, where 20 - is the number of pages that you need. Open in paragraph "Personal Design" menu "Design" to edit your design. 20 - this is just a page number that we are remembered from the example. Save the design. All you now have in place the label PAGE20 will appear a block of text that can be recalled at any time to edit. The block will be stored in the page list №20 pages.